The international Hinode mission was launched from Japan on 23 September 2006. The spacecraft carries a suite of instruments that permit observations of the Sun and its atmosphere with unprecedented resolution and precision. During its first two years of operation, Hinode has enabled numerous breakthroughs in our understanding of magnetic fields within the solar atmosphere and their relationship to the energetic solar phenomena that affect the Earth's space environment. Some of those breakthroughs were presented at the First Hinode Science Meeting held in Dublin, Ireland, in August 2007 (ASPCS Volume 397). By the time the Second Hinode Science Meeting was held in Boulder, Colorado, 29 September-3 October 2008, researchers had been able to subject Hinode data to in-depth, quantitative analyses and to make comparisons with detailed numerical and analytic models of solar phenomena. 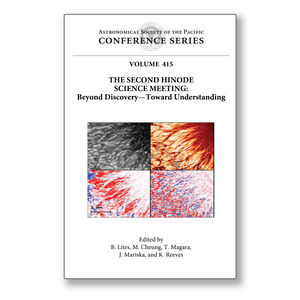 This volume presents brief summaries of work presented at the Second Hinode Science Meeting.